It was with considerable disillusionment that I hit my 30s and discovered that eating whatever I liked and never exercising would no longer result in a consistent weight. Over the last decade I have switched to computing my mass in kilograms so that the increases can be represented with smaller numerical values. My diet has improved and the force I exert on the bottoms of my shoes has stabilized, but so far I have had little luck lightening the load. Perhaps I should not be surprised: I spend my day hunched over a computer screen. When not hammering a keyboard I am usually driving my children to and fro along HW101, Silicon Valley’s central artery, now so congested that it will almost certainly deliver the Bay Area’s eventual cardiac arrest. I am lucky enough to live just a few miles from work, and have often considered building some exercise into my commute. I bought a fold up bike, which is fun to ride and has tiny little wheels, but the distance is barely sufficient to break a sweat. I walked to work a few times, a lone pedestrian threading my way along the concrete network of avenues built only to be passed through and not lingered upon, dodging construction sites and used needles. Once, on a weekend, my family away at some function, I rollerbladed my way to work, which was fast and exhilarating and only required a small sacrifice of pride. The rollerblades, however, are bulky and heavy, and require a separate pair of shoes to be carried to the destination. My commute experiments have too many demerits to deploy as a regular practice. 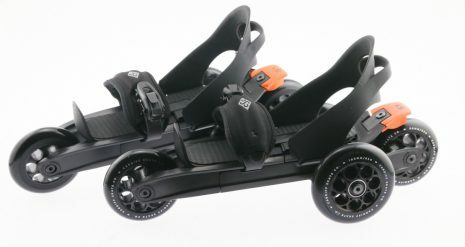 It was one evening, as I sat at my display (now for leisure rather than work, but in the same bowed position), deeply frustrated with my inability to burn calories reliably, that I chanced upon the Cardiff Skate S1. 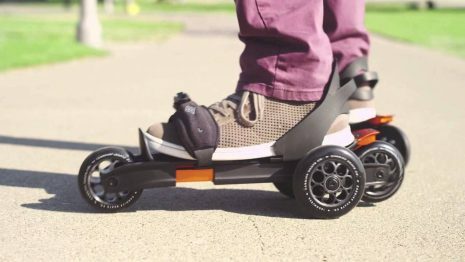 This device, a marvel of modern engineering, is a skate that you strap to your regular shoes. A contemporary version of vintage clamp-on roller skates, rendered in high quality rubber and metal, which costs $139.99. I immediately pictured myself skating to work, popping the skates off at the door, and casually walking to my desk. It seemed to me, in that moment, that the Cardiff Skate S1 offered the blend of exercise and convenience that would finally allow me to banish my second chin. Amazon even had it on sale. I can distinctly remember a period of my youth in which every child in my town held their birthday party at the local roller rink. It was a dark, low ceilinged building with mustard shag carpet bordering the smooth floor. A scary old guy would sit at the counter and crack glow sticks for anyone with the guts to approach him. A row of pinball machines hugged the back wall. It was the definitive birthday party spot for every kid my age. At some point the birthday party vogue shifted to a much newer (not to mention better-lit) ice rink, and I went with it. Oregon in the mid-1980s did not have a wide variety of structured play options to offer parents. I suppose the decrepit roller rink left an impression. Nearly three decades later my own children are good skaters. We get up early to play ice hockey on the weekend, we frequent the inline skating sports center near us, and our garage is now home to a variety of bladed and wheeled foot contraptions. Somewhere, deep in the withered cellular mass that passes for my calf muscles these days, the memory of how to stay upright with wheels strapped to my feet has persisted. I am a permanent carrier of a skill virus I picked up trying to learn how to shoot the duck under a mirror ball in the fourth grade. Despite our family enthusiasm for the skating sports, my wife was skeptical of the Cardiff Skate S1. First there was the question of safety: did I really want to navigate the concrete tundra that separates our home from my office with wheels strapped to my feet? Moreover, the three-wheel triangle design of these skates failed to impress her. “They look lame,” she told me. She is patient with my white male engineer obliviousness to cool and never even complains about my Prius. But there are limits, and the S1 obviously crossed the line. I argued that the convenience of a strap-on skate was worth a tiny shame investment, and anyway I’d be moving so quickly that passers-by would see only a blur as I rocketed down the street. The Cardiff Skate S1 box was surprisingly heavy, and indeed the skates themselves proved to be industrial strength. I stowed them in the garage and waited for the weather, my morning meeting schedule, and my stamina to form a syzygy. Finally the day arrived. I strapped the heavy metal contraptions to my shoes and tooled around the garage. The skates took some getting used to, particularly the weird double back wheels, which make turning difficult. But soon enough I was confidentially zig zagging across the concrete floor like an overweight nerd ballerina. I could almost hear the opening bars of The Nutcracker. At 8:30 AM I rolled out of the garage and into the street, pointed my toes in the direction of my office, and set off. I decided to take the most direct route to work, which involves skating on sidewalks rather than in the street. This proved tougher than I expected. The large back wheels of the S1 bumped uncomfortably at each gap in the pavement, and I found it difficult to get any sort of regular momentum. I pushed myself harder, and after a block had almost managed to reach a respectable speed when I realized that I had no idea how to break. I fumbled to execute a half pivot, which is an easy way to slow yourself on inline skates, and nearly collided with a tree. When I had regained my composure I remembered that the S1 has a rear break, a strange secret fourth wheel which adds friction when you lean back on your heels. After testing this a few times I felt confident enough to continue. It was like skating through mud. The heavy skates refused to glide, and the only way to reach any sort of interesting speed was to concentrate every leg muscle into every push. I had travelled only a few blocks and was already drenched in sweat. About a mile from home blisters on the back of my heel developed and burst all at once. Despite my discovery of the break I was barely able to keep myself upright, the skill virus in my limbs apparently incompatible with these alien foot wheelbarrows. I became keenly aware that I was traveling along the street that nearly all my coworkers take to reach our office. I could feel the cars slow as they passed, perhaps to stare at the logo of my employer that covers the face of my backpack. It occurred to me that I had perhaps failed to assess the gravity of my wife’s advice. Halfway to my goal I trundled to a stop. I was exhausted and clung to a stop sign for support. My feet felt like they had just returned from an unfortunate date with a weed whacker. My face was burning, both from the excessive physical requirements of the Cardiff Skate S1 and the immense shame known only to those who suffer the consequences of their own incredibly poor decisions in public. I had been wrong, totally and completely wrong, more wrong than I can recall having been ever before. There was nothing for it. I sucked in my gut, gathered up my Hawthorne shame, and started back towards home. Oh Chris, what a great post. I’m rolling on the ground right now. I saw these skates and was wondering if they’re any good. I guess I will take your wife’s advice: “They’re lame”.